SFC Members Help Solid Ground "Strike Out Hunger"! 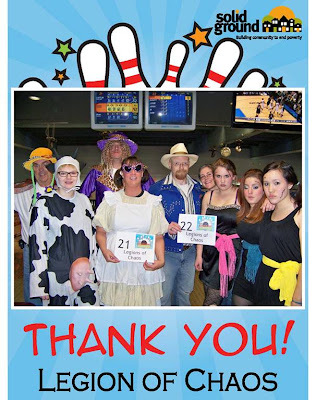 On March 27th, 150 folks came out to the Solid Ground Strike Out Hunger Bowl-a-thon to benefit Food Security for Children, a program that helps Seattle Food Banks serve low-income families with young children by supplying them with nutritious foods and essential baby supplies. The event was a smashing success with over $12,500 raised. Thanks to Seattle Food Committee Team "Legion of Chaos" for their fundraising efforts and for lending their awesome energy to the cause! Child Nutrition Reauthorization is here! Now is the time to ask Senators Murray and Cantwell and Congressman McDermott to invest in the future health of our population, our economy and our national security by strengthening the Child Nutrition Act to the tune of an additional $10 billion over ten years. Strengthening these programs will ensure our kids are receiving the proper nutrition where they live, work and play, AND go a long way to fighting childhood obesity. The Child Nutrition Act is a large piece of legislation that comes up every five years or so and funds critical nutrition programs for our low-income infants and children, including WIC, national school lunch and breakfasts, afterschool snacks and summer feeding programs, and feeding programs in child care and adult care settings. Senator Lincoln has introduced the Healthy, Hunger-Free Kids Act of 2010 to begin the reauthorization process in the Senate, but the bill falls short of the full $10 billion necessary. Study after study show that hungry kids simply cannot learn in the classroom. Chronic hunger has profound impacts on kids’ ability to focus, retain and thrive in our schools. Providing our children with proper nutrition for the school day is critical to the future success of our country. The childhood obesity epidemic in this country threatens the future health of our population, our economy and our national security. For many low-income kids obesity and malnutrition are closely linked as families are forced to make short-term bargains, buying fast food or other high-calorie, low-cost foods to feed the family at the expense of long-term health consequences. Obesity puts kids at risk of heart disease and diabetes later on in life and can shorten one’s lifespan up to a decade. Last year in the U.S. we spent almost $150 billion on obesity-related medical costs. The childhood obesity epidemic also threatens our national security, where three out of four 18- to 24-year olds today are unfit for military service, due in large part to either obesity or lacking a high school diploma. Strengthening the Healthy, Hunger-Free Kids Act of 2010 to the level of $10 billion over 10 years will complement other national efforts to tackle child obesity like First Lady Obama’s recently announced Let’s Move initiative. We have a responsibility to ensure all our kids are getting the nutrition they need to be healthy and reach their full potential in the classroom and beyond. Ending childhood hunger is a matter of public and political will, we have the food, we have the infrastructure, and we have the know-how. What we need now is the political will to show our kids the money! Call or write Senators Murray and Cantwell and Congressman McDermott today and ask them to invest in our children, invest in our future, and strengthen our investment in the Child Nutrition Act. Congratulations to the North Helpline Food Bank! They were honored with a Food Lifeline Agency Excellence Award for Excellence in Collaboration. North Helpline has been serving the North Seattle community for 20 years. When the organization found out that it's former location was slated for demolition, the agency decided that it was time to rise to the challenge of finding a permanent home for these critical human services that would accommodate the pressing needs of people experiencing poverty for years to come. They sprung into action, engaging their wide network of volunteers and supporters to raise funds. They talked with government partners at the City of Seattle who suggested that they partner with the Low Income Housing Institute (LIHI), who already had plans for a new Lake City apartment complex that would incorporate commercial space on the first and second levels. North Helpline purchased 7500 square feet of space at what came to be know as McDermott Place and, on January 19, 2010, they opened their doors. The beautiful new facility boasts an expanded medical clinic, an emergency services program and, of course, a wonderful food bank. They even plan to launch an evening food bank distribution this year to better serve individuals who work during the day. Congratulations North Helpline on your new home and thank you for your tireless efforts to make sure all community members have access to the resources they need to remain healthy and housed. The Seattle Food Committee is staffed and supported by Food Resources, a program of Solid Ground.